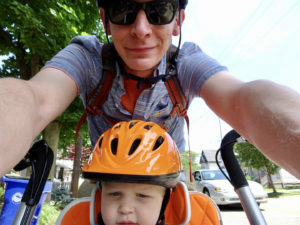 Jacob has served as the executive director of Bike Cleveland since February of 2012. An alumnus of Spring Arbor University where he earned a degree in sociology with a concentration in community development, Jacob is now a passionate Cleveland transplant. Prior to becoming director of Bike Cleveland Jacob was the active living coordinator at Slavic Village Development where he created and implemented programs that got residents connected and active in the community. 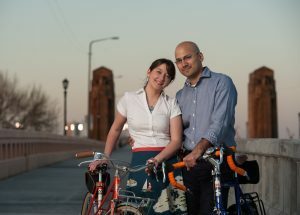 As part of his work at Slavic Village Development Jacob served as the convener of the leadership team that created Bike Cleveland. 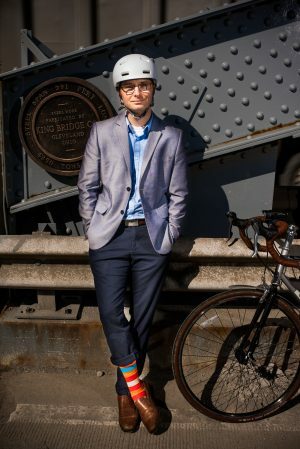 As director of Bike Cleveland Jacob works closely with volunteers and members to affect policy, legislation and infrastructure that help make Cleveland’s roadways safer and our neighborhoods more vibrant. Jacob can be contacted at 216-273-6863 or Jacob@bikecleveland.org. Jason joined the Bike Cleveland team in January 2017. He is a lifelong cyclist – with years of graphic design and marketing experience, as well as a Business Degree from Walsh University. 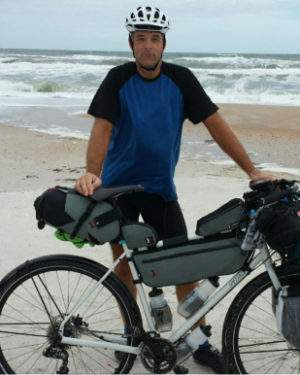 Jason worked within the bicycle industry for over 2 decades. He knows firsthand the issues facing cyclists, the fears of new riders, and positive impact that cycling can have on health, communities, and business development. 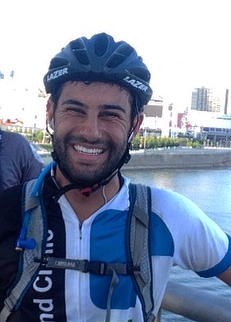 Fostering this positive impact is what drew him to join the Bike Cleveland team. Deltrece has over twenty years of experience educating people of all ages. 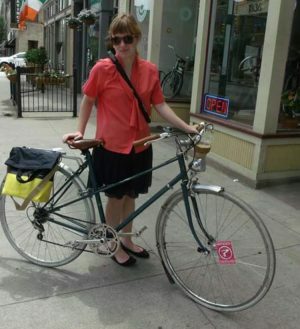 You can often find her volunteering at the Ohio City Bicycle Co-Op repairing, building bicycles, making tasty vegan meals in the kitchen, or leading social rides throughout the city. She would more than likely be wearing a Black Girls Do Bike jersey, which consists of other women of color throughout the United States that share their passion of cycling. 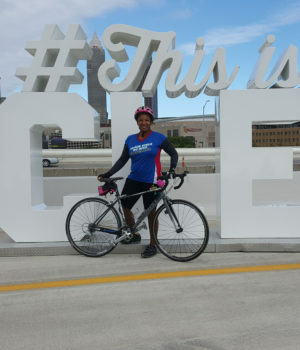 Cleveland has a local BGDB Chapter and Deltrece shares cycling related information and also lead social rides throughout Cleveland and neighboring cities that often has Black History informational background. Deltrece attended Kent State University where she became a member of the international, historically Black greek letter sorority Zeta Phi Beta, Inc. She obtained her Associate of Applied Science degree and the Administrative Award certificate in Early Childhood Education from Cuyahoga Community College, and in 2016 became a League Certified Instructor to further her goal of educating people on bikes. She enjoys commuting to work via bicycle and is not afraid to utilize public transportation for part or all of the commute depending on Mother Nature’s mood. You may have recognized her in Cleveland’s Terminal Tower if you are hopping on RTA’s Red Line going Westbound. Real Estate Development Director, Burten, Bell, Carr Development, Inc. I only own one bike, and that’s an Electra Ticino. Most of the riding I do these days is comprised commuting and running errands, so it does the job. My wife and I are looking forward getting a family bike that we can use to haul our two kids around. What is your favorite Cleveland area ride/route? What is your favorite one anywhere? I may be slightly biased because I help coordinate it, but I absolutely love Cranksgiving. The generosity of the cycling community is always amazing. To see the massive pile of food cyclists selflessly purchase for disadvantaged families at the conclusion of the event is extremely moving. What does riding a bicycle mean to you? I feel like I’m contributing to a more vibrant region by cycling for transportation, plus it’s a very satisfying feeling not to have to rely on an automobile. How have you been involved in the Cleveland cycling community in addition to your involvement with Bike Cleveland? I started attending public meetings in Old Brooklyn to advocate for cycling infrastructure and amenities in the late 2000’s. I became known as the “bike guy” in the neighborhood, and was asked to lead tours and rides. In 2010, a small group of us decided to host our own event, Old Brooklyn Pedal for Prizes. We have hosted the event five times and have attracted thousands of cyclists of all ages and from all walks of life to experience Old Brooklyn by bike. 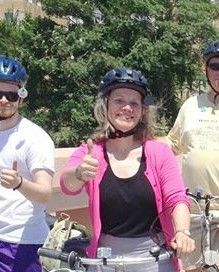 I’ve also coordinated or helped organize several different rides locally. Why drives you to serve on the Bike Cleveland board? Bike Cleveland is needed to represent the interests of all cyclists and has made a huge difference in Northeast Ohio in its brief five-year history. I want to help Bike Cleveland become the best, most effective cycling advocacy organization it can possibly be. What’s your vision for the future of cycling in Cleveland? Cycling is a very safe and convenient form of transportation for everyone everywhere. Well, I have more than one but I love riding road bikes – especially my commuter and a Gunnar Sport. What’s your favorite place to ride your bike? I enjoy my commuting routes between the near eastside and downtown a lot but, when I can get out of town to ride, really enjoy both the Chagrin and Cuyahoga Valleys. What motivates you to ride your bike? Healthy, green commutes, vigorous exercise with great scenery … and weight loss (though you can’t really tell by looking at me!). Squire Patton Boggs has an incredibly active Bike Committee that engages our people on bike commuting as well as riding for exercise and charity. I’m also involved with Bike Shaker. What’s a favorite memory you have of riding a bicycle? My wife, Karen, and I raised our kids on bikes, which has given me many happy memories. One favorite and recent memory was riding to Sandusky with both adult kids during Pedal to the Point – a full, sunny day in the saddle with them just chatting and enjoying the ride. Why did you choose to serve on the Bike Cleveland board? Cycling issues and projects are accelerating quickly now in northeast Ohio and Bike Cleveland is at the heart of things. I’m thrilled to be a part of that and lend a hand. I proudly ride two Ohio City Co-op bikes both late 80’s vintage — a Nishiki Cresta GT road bike. And a Univega Range Rover 18 mountain bike that is set up as a hybrid for rough city streets. Have to admit, I am partial to the Nishiki, it is a beauty, and quick! It means physical fitness, doing my small part for the environment, saving money, and providing ‘eyes on the street’ to help Cleveland neighborhoods feel safer. I love love love that first few moments, when I push off, and glide down the street feeling the wind in my face — reminds me of being eight years old and carefree. I also crave the meditation time that a cycling commute provides, and the urban experience of seeing the city up close and personal. I am a strong advocate for cycling infrastructure and necessity cyclists. I volunteer for as many cycling events as I can, both Bike Cleveland and others. I speak up for bicycling in my other life as neighborhood advocate. The Ride United to Akron fundraising ride that United Way put on a few years ago, my sone rode with me and we took the train back. The runner-up is riding in Central Park with my husband a number of years ago. What’s your favorite cycling event? The NeoCycle Fundo, I want to help people explore Cleveland neighborhoods. I also value the Ride of Silence, it’s not a happy event, but deeply meaningful for me, as I personally know several people who have died from car crashes while riding, and several more who have been seriously injured. To be a part of the movement to make Cleveland a cycling-centered town. Improving the ride of all cyclists and building a broad huge constituency ‘tent’ that includes us all — from mountain bikers to necessity cyclists and everyone in between. I want cycling to be a draw that keeps our young people here, helps stretch transportation for those with limited resources, and contributes to vibrant neighborhoods. Freeform: What else should our members know that makes you unique? I am a long time resident of the Broadway Slavic Village neighborhood, and passionate about building thriving neighborhoods in Cleveland. Since I joined Bike Cleveland, I have slimmed down to three bikes, but my favorite remains “Tonia”, a touring bike kitted with front and rear panniers. I’ll ride that bike across the neighborhood and across the state. I enjoy riding from my near-west side Cleveland neighborhood down to Kent and back. My route takes me through city streets, along the Towpath Trail, and down the Summit County Hike and Bike Trail, and as such, really encompasses all of the cycling options open to folks in Northeast Ohio. 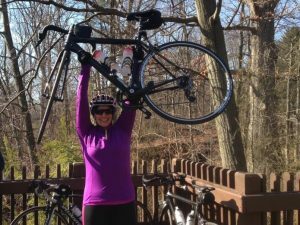 But, my favorite ride is the American Cancer Society’s Pan Ohio Hope Ride, which takes me and several dozen other riders across Ohio. 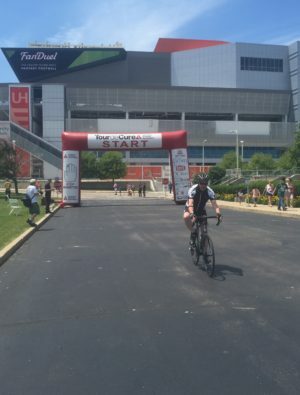 I’ve gained a newfound appreciation for my adopted state through this important ride that has raised millions of dollars for those fighting cancer. Riding a bicycle makes me more connected to my community and my neighbors. I move at a reasonable pace and am able to stop and chat or see things that one simply cannot while ensconced in a car. I’m proud to be the director of Slavic Village Development, where we are building Cleveland’s premier “Active Living” neighborhood. Together with neighborhoods across the region, we are creating better communities through walkability and bikability. 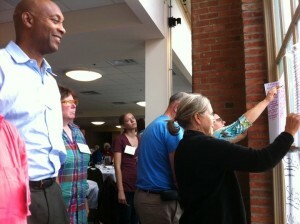 What drives you to serve on the Bike Cleveland board? In just the short few years of Bike Cleveland’s existence, its members have changed how local government views and supports cycling, and we have changed state law as well. As a board member, I want to give that power to the everyday citizens to improve their communities. As we improve cycling in Cleveland, we are creating friendlier, more connected, and more diverse neighborhoods. We have the opportunity to use cycling as a way to make Greater Cleveland the model for communities around the world. I’m better at playing the hand ocarina than anybody I know. I have two bikes. A Specialized Roubaix and a Specialized Tri-Cross. I use one for the road and one for the trails. I like them both equally. I still love the towpath but my true passion is riding on country roads away from civilization. My favorite ride of all time was the GAP. I feel strongly about bicycle safety and the need to educate both motorists and bicyclists on how to get along on the road. I also feel a vibrant city has to have a bicycle friendly environment. I would love to see the day when cycling is simply a part of our infrastructure. To and from my parent’s house on the Shaker Heights off-road bike path. Popping a wheelie as a child. A multi-county interconnected system of safe bikeways that support both commuting and recreational cyclists. I chose to serve on the Bike Cleveland board to support the needs of urban cyclists, and help revitalize recreational opportunities, and to improve school biking for inner-city youth. 9 completes and 2 more in spare parts. I’m sure more are needed, though. Anywhere on my cruiser bike followed closely by the Emerald Necklace on the race bike, counter clockwise of course. Anywhere? Lift assisted big travel mountain bikes at Deer Valley resort in Park City. Fun. Fitness. Lifestyle. A way to hurt my friends legs. Former General Manager of Spin Bike Shop; co-organizer of NEOCycle; member of the cycling Nights Watch on Valley Parkway in winter. I used to be staff at Bike Cleveland and although I left, I wanted to find a way to stay and help. As a shrinking legacy city with hugely wide boulevards and a road network initially designed to serve a population three times what we have, we have a unique opportunity to repurpose that network to serve so much more than just cars. With the right leadership, it could happen. We can be much better. We need to push. Where is your favorite place to ride your bike? I don’t like walking or driving that much. Have you been involved in the Cleveland cycling community in addition to your involvement with Bike Cleveland? I’m a daily cycling commuter and pass holder at “The Bike Rack” downtown. 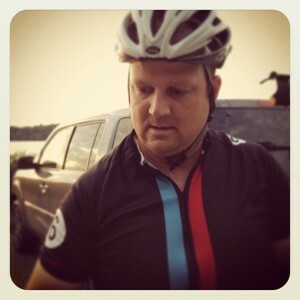 I’ve been racing mountain bikes since 1988 and volunteer for NEOCycle. I used to work in the bike industry as an employee of the old (now gone) City Bike. 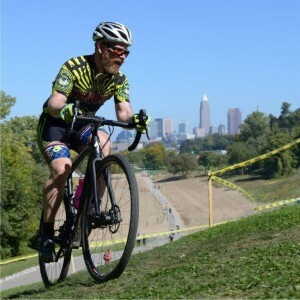 I was a contributor to the book Car-Free in Cleveland 2000, and most recently took over running local mountain bike racing team, The Marauders. Riding behind my son as he cleared his first box jump at Ray’s Indoor Mountain Bike Park. Separated bike lanes all over town connecting residents to school, work, retail, and recreation. As a daily rider and as a parent, it’s in my own self-interest that Cleveland has better cycling infrastructure. More importantly, as someone who loves Northeast Ohio, I want to help Greater Cleveland become a national leader in developing a culture of cycling as it embraces new transportation solutions. Cities with rich cycling cultures are proven to be more vibrant and attractive places for people to work and play, and I’m passionate about my role in helping Cleveland benefit from those trends. I own 2. I can’t pick a favorite. The first is an old Fuji mixte that my husband fixed up for me for Valentine’s Day when we first started dating. The other is a Surly Long Haul Trucker that I ride almost every day in fair weather. I like riding over the Lorain Carnegie bridge every morning on my way into work. It’s totally protected and an invigorating view. It’s a nice start to the day. Freedom, self-reliance, strength, one less car! About 9 years ago when I moved to Ohio City and did Critical Mass for the first time. I am amazed at what Bike Cleveland has been able to achieve as a relatively young nonprofit, and I feel passionate about its mission. To me, building a community that is less (or not at all) autocentric makes sense on so many levels: it’s more equitable, more sustainable, and more interesting. That everyone will see bicycling as a mainstream form of a transportation. I was on the Antiques Roadshow once. It’s unusual for a bike junkie, but I only own one bike. It’s a beautiful matte black Cannondale CAAD10. I spend a lot of time on Valley Parkway – our Metroparks are one of our region’s greatest assets. I’m also fond of riding down Lake Road to take in the views of the lake. 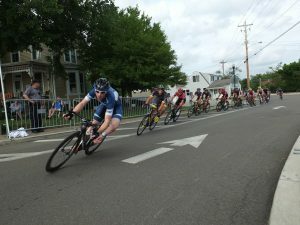 I’ve been a member of the Cleveland Triathlon Club for years and I spent a year as a member of Team Stelleri, a local women’s cycling racing development team. As an avid cyclist, the mission of Bike Cleveland resonates deeply with me. I want to spread awareness and acceptance to help make our streets a safer place for everyone. Also, my love of Cleveland is a driving factor. A bike-friendly city is a healthy city, very obviously in the physical sense, but studies also show it also promotes increased economic health as well. I want to see a day where cyclists and cars safely and peacefully share the road. I also want cyclists/bikes to be an integral part of transportation and infrastructure discussions, not an afterthought. In addition to competing in triathlons, I’m training to be a competitive powerlifter. I only own one bike (shocking). It’s a Cannondale CAADX so it’s a bit of a swiss-army bike and can handle it all; on the road and trail. I definitely see myself investing in a full suspension MTB in the future. When it comes to organized rides, I’m a bit biased to mention VeloSano since it’s my full time job. Experiencing thousands of Riders, Volunteers and supporters rallying together around one common cause is overwhelming. Every dollar raised benefits lifesaving cancer research at Cleveland Clinic. The Rocky River Reservation is my go-to leisure ride. When it comes to my favorite tour, going around Lake Erie is most definitely tops on the list. Freedom and joy. Riding a bike is mode of efficient transportation that’s virtually free. Especially in communities like Cleveland and local suburbs where driving isn’t always necessary. And let’s face it, it’s hard to not smile when you’re riding a bike. I’ve volunteered with Bike Cleveland in different capacities since 2013 prior to joining the Board. This was around the same time that I started my career at Cleveland Clinic to help our team bring VeloSano to fruition. I work very closely with many of the local bicycle shops throughout Cleveland. I was born in Cleveland and grew up in Lakewood. I love seeing/being a part of the growth and development within our community. Cleveland is great. There’s no reason that we can’t be among the leaders in the nation for sustainable infrastructure and transportation. I think it needs to go a bit deeper than just cycling. I believe the future of transportation in Cleveland needs to continue evolving. Everyone should be able walk, ride, or drive on roads, paths, etc. in such a way that there is little room for error for all parties involved. Infrastructure should continue to be developed and enhanced so that all modes of transport can co-exist and work together seamlessly. We’re making great strides but there’s always more to be done. I formerly founded Rewarding Rides with two of my close friends. We would embark on an annual multi-day cycling tour benefitting different local causes. The motto was simple; “Do something nice for someone, today and every day.” It was fun to pack up our panniers (or a trailer) and just GO for a week at a time, camping along the way.